The treatment of haemorrhoids mainly depends on the symptoms they cause, their size and whether they are inside the back passage, outside or both and aims to relieve these symptoms. For minimally symptomatic haemorrhoids, increasing the fibre and fluid in your diet to improve the constipation and stop you from straining with the potential use of local creams with soothing agents and steroids are usually enough. Warm bath (Sitz baths) soaking of the area for 10-15min two three times a day may also be beneficial. If these measures fail or symptoms are significant, the range of treatments include banding of the haemorrhoids, haemorrhoidal artery ligation or open haemorrhoidectomy (Milligan-Morgan). If you have a thrombosed (painful clot) haemorrhoid then you may require incising of the skin over the haemorrhoid and draining of the clot under a general anaesthetic, in order to relieve your symptoms. The most appropriate treatment option will be discussed with you at the clinic at an individualised basis. This procedure can take place in the office and is a very safe procedure. 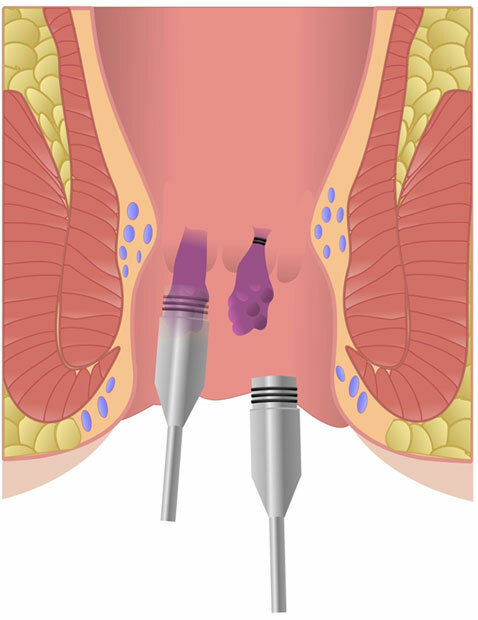 Proctoscopy is performed and a suction tube is used to trap the haemorrhoidal tissue and a small rubber band is placed over the haemorrhoid cutting off its blood supply. The band stays in place for a few days until the haemorrhoid falls off leaving behind a small wound which takes a few weeks to heal. The procedure can cause some degree of discomfort, when the band is initially placed it can make you feel slightly light headed and while the band is in place may give you the sensation of wanting to open your bowels. It can also cause some bleeding and there is a small risk of infection. The risk of the haemorrhoids returning with this procedure is slightly higher (30%) compared to the surgical treatments but the costs and risks are lower and it can be repeated as many times as needed. This procedure requires a general or regional (spinal) anaesthetic and is designed to eliminate the haemorrhoids without requiring any cuts. It involves the use of a special proctoscope with a miniature ultrasound probe at its end which is used to detect all the vessels supplying blood to the haemorrhoids. Once located each vessel is tied off with stitches in order to take away the blood supply to the haemorrhoids and shrink them away. Once the vessels are tied off any excess tissue is then pulled up and secured with internal sutures (rectoanal repair) to take away any significant swellings around the back passage. After a few days to weeks the haemorrhoids shrink away. You will get some degree of discomfort following the procedure and there is a small risk of bleeding and infection. The risk of the haemorrhoids returning is small (10-20%) but the procedure can be performed as many times as needed. Open haemorrhoidectomy requires a general or regional (spinal) anaesthetic. This procedure is usually reserved for haemorrhoids which have failed to respond the other procedures, are very large (grade 3-4) or mainly on the outside of the back passage. It involves the removal of the skin around the back passage along with the haemorrhoids and tying off of the vessels supplying the haemorrhoids. After the procedure the wound is left open to heal or if the ligasure energy device technique is used the wounds are closed. Pain after this procedure can be significant and it can last up to 6 weeks. Studies have shown that ligasure haemorrhoidectomy is less painful. Other complications include a small risk of bleeding, infection, temporary urinary retention, narrowing of the back passage, developing skin tags or a fissure, incontinence to flatus and a very small risk of the haemorrhoids coming back (5-10%).